The two individuals were supposed to be kicked out of Norway and back to Russia but refused and sat down on the borderline between the two countries. Today’s forced return of migrants from Norway to Russia was the first since Norway this week adopted new restrictive measures against the travellers. That operation did not proceed smoothly. When forced back across the border, the men decided to sit down on the borderline between the two countries’ border crossing point of Storskog-Borisoglebsk. The Independent Barents Observer was present on site when the incident occured on Friday afternoon. Police communication officer Anders Stang Lund confirms to NRK that the situation was resolved only after the Norwegian and Russian border commissioners arrived to the border crossing point. ”After dialogue between the border commissioners, the two asylum seekers were taken back to the Norwegian side”, Lund says to NRK. According to the broadcaster, the Norwegian police has attempted to return five individuals back to Russia. ”This has not succeeded”, says Arild Strømmen, spokeman for the police foreign individuals unit. ”They are now detained and placed in sealed off location. They will be returned to Russia or to their home countries as soon as possible”, he adds to NRK. 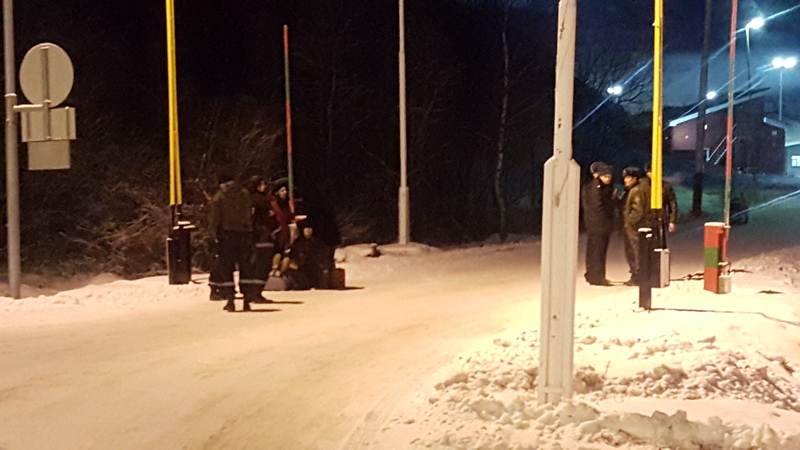 As previously reported, the Norwegian government this week instructed immigration authorities to reject applications from everyone with resident papers in Russia arriving over Storskog check-point. Since late August, more than 5,000 asylum seekers have come to Norway via the Arctic Route from Russia’s Kola Peninsula. Not all of them are fleeing from wars or persecution in their country of citizenship. The Government has received the Parliament’s approval of legislative amendments enabling a swift return back to Russia.